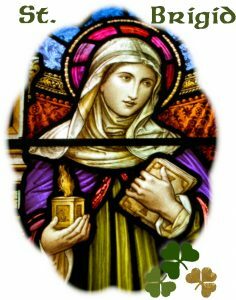 Saint Brigid, a contemporary of Saint Patrick, is probably the second best known Irish saint. As in the case of Saint Patrick, not much is known about her life. Some think that she was born in County Kildare in about 457, but local tradition has it in Faughart, County Louth. Her parents, Dubtach and Brocseach, might have been members of noble families. Another account says that Brigid’s mother was a slave in Dubtach’s household. Brocseach was a Christian, but Dubtach probably did not convert until later in his live. Brigid was known for her generosity to the poor. For example, as a child she once gave away her mother’s whole store of butter. Later [probably after being made aware of her mother’s concern], she prayed and the store of butter was miraculously renewed. When Brigid rejected her father’s choice of a husband for her, she took up the monastic life. She took vows before Saint Mel, the abbot and bishop of Longford. It is said that the bishop mistakenly consecrated her a bishop! [Such a misunderstanding might have occurred if she was immediately made an abbess. Since the story goes on to say that she went about seeking land for her community, it is implied that she was the founder and abbess]. Anyhow, she asked the King of Leinster for only as much land as her cloak would cover. The cloak miraculously spread over the whole of Curragh. As in many countries of the world, Christianity in Ireland superimposed itself on the Celtic tradition. Pagan worship sites became Christian worship sites. Brigid’s feast day of February 1 was also the pagan festival of spring. Brigid, meaning “exalted one” was a general name for Irish goddesses. The name “Kildare” means “church of the oak,” and the “sacred” fire there probably burned for centuries into the Christian era. Just as in the time of the prophets of old, the Christian Church had to be ever vigilant against the people reverting to pagan practices, including idolatry. Brigid traveled by chariot throughout Ireland, carrying on Saint Patrick’s work of conversion, but there is no evidence they ever met. Through her intercession, lepers were cured, the dumb spoke, and many other kinds of healings occurred. She is said to have turned water into ale and stone into salt. She had that special rapport with animals often observed in saints. She obtained the release of captives. Perhaps her best-known miracle is of her visit to a dying pagan chieftan. While she prayed, she plaited rushes into a cross. Having heard her account of our Savior’s Crucifixion and Resurrection, he was baptized before he died. It is still customary on February 1 to plait Saint Brigid’s crosses which are used as holy objects to protect a household in the year ahead. Adapted from Keltic saints, by Martin Wallace (San Francisco: Chronicle Books, 1955), pp.13-15.